Creating a grocery list can be a task that you dread, especially when you are seeking to create a healthy grocery list. If you want – or need – to be on a low carbohydrate diet, you might struggle when it is time to grocery shop, you might not know just what foods are off limits to you. This grocery list template helps to make your life easier by providing you with a simple, easy to use, healthy grocery list. 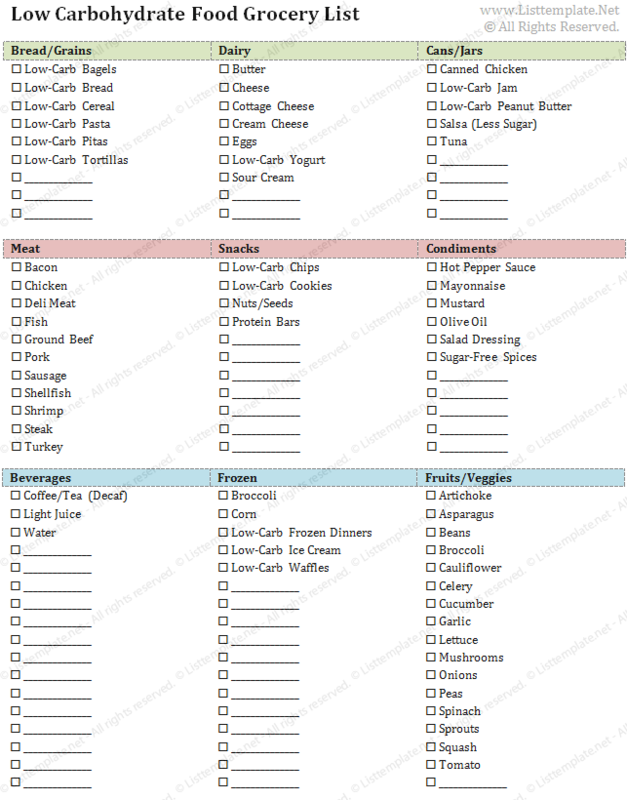 This low carbohydrate food grocery list template includes a checklist of all of the foods that you can buy and eat while still staying true to your low carbohydrate diet. The template includes categories of food – such as bread/grains, dairy, condiments, etc. – and it only lists the types of food that qualify as being low in carbohydrates. If you are looking to shop for low carbohydrate food, this grocery list template will become a lifesaver for you. Created in Microsoft Word ®, this professional template makes grocery shopping a simple and easy task.